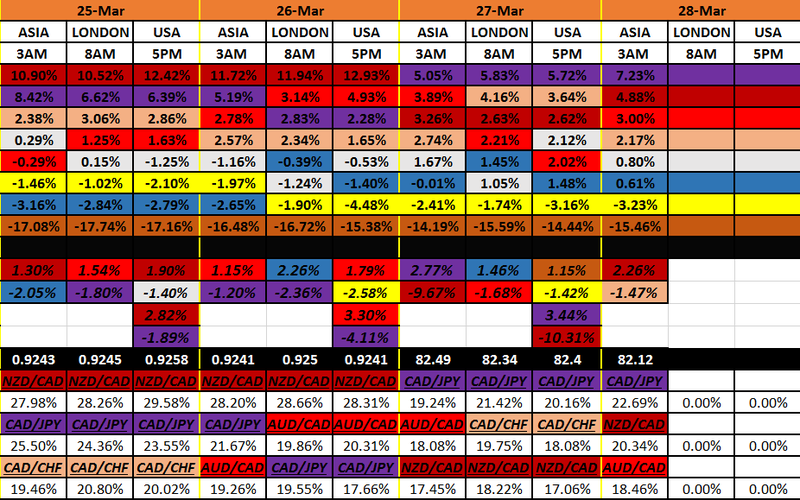 AUD (red) most bid that session +1.28%. GBP (blue) most sold that session -2.35%. A bit of negative flow -.94%. Looks like some risk-on came back during the London open thru their lunch. And the GBP is not favored whatsoever. I guess things aren’t looking good for them lately. Let’s see what the monthly table looks like. 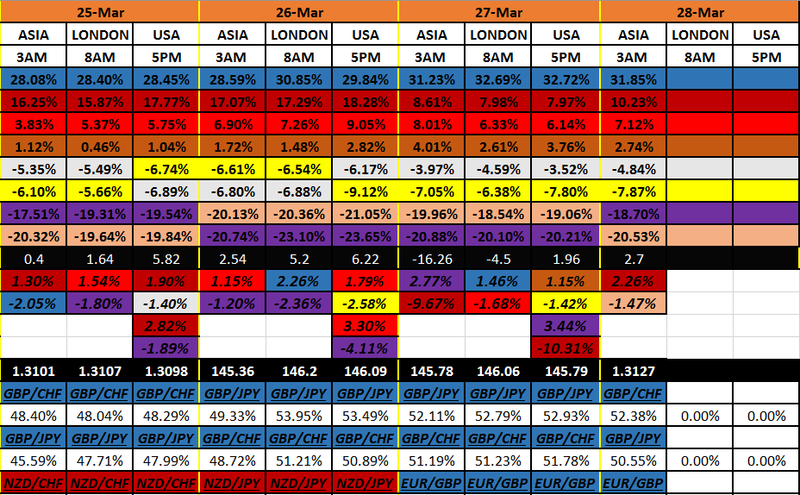 Well, as you can see, we basically have a lot of non-moving currencies there in the middle. 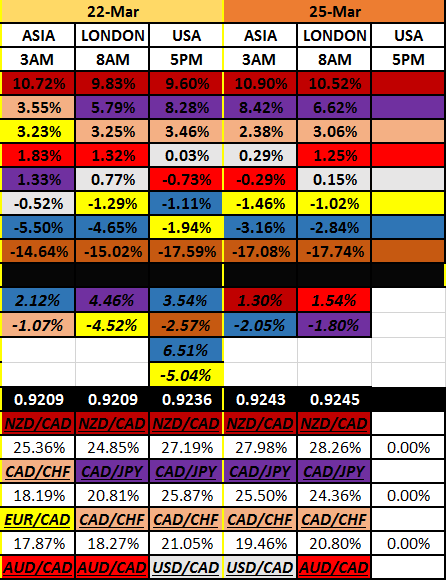 Then you have the NZD (dark red) keeping the most bid currency for the month. And then you have the CAD (brown) as the most sold off currency this month. It’s pretty cut and dry. But in total aggregate…the CAD is what’s grabbing the most consensus. Sitting at -10.58%. It’s kind of nice when things like that continue. Right? Makes our jobs a bit easier. See, I will always truly believe that if you keep an eye out with what’s happening between all of them, it can result in an accurate sentiment. Otherwise known as knowing what’s going on. Well…speaking of that…in about 5 hours or so from now, we should see something move. Sure, not all at once, cause I think the big money wants the dust to settle first and strategically move the market the way it wants to. But, give it the rest of the week and we should have a clearer sense of the direction of things. And see, this is a good thing here, cause we can always compare whether the market wants to continue or make a change in the way it was going. Got to know what’s been happening first. And then to see it unravel. Let’s get on with the day. Let’s see how it flew. 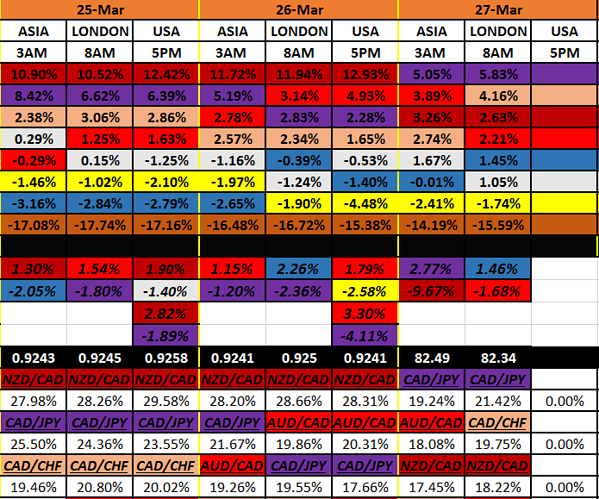 JPY (purple) most bid that session +3.28%. GBP (blue) most sold that session -4.32%. CHF (pink) most bid currency today +3.25%. GBP most sold currency today -6.53%. Well now we have some movement. Yeah boy, the market took off. Let’s see if I can put some kind of summary to it. Aggregately speaking. But, I need to put up the monthly table first. I can’t really see any risk-on or risk-off sentiment. I think we have a bunch of different stuff going on. And it has to do with a lot of single currencies traveling their own way. Let’s see. CHF (pink) also very much a bid. GBP (blue) …God help them. Not good. JPY (purple) got a boost higher. The Comms (NZD,AUD) are favoring the bid more than the sell. I don’t know. Will this propel the EUR and the CHF up and coming? From the looks of today, it might be in the cards. But I just don’t know. We’ll have to see how the week ends. One point I do want to make though. We have a little time, but next week is not only the end of the month, but the end of the 1st quarter. And I bet things are gonna fly. I’ll call it a repositioning of the portfolio’s. Look. It’s just what goes through my mind during this time period. I’m cautious and aware of that. You should be too. All we can do is be objective about it. But, in the meantime, I’ll tell you when I see a real change. We need more time though. Cause today really can be just a knee jerk reaction. Once all the sessions get their turns, we’ll have a better idea where the consensus lies. Right? See ya in the morning time. It’s been a while @MikeWolski! But I’m super happy to see that you’re doing great. Keep it up! I’ll always be cheering for you. Woooooh! 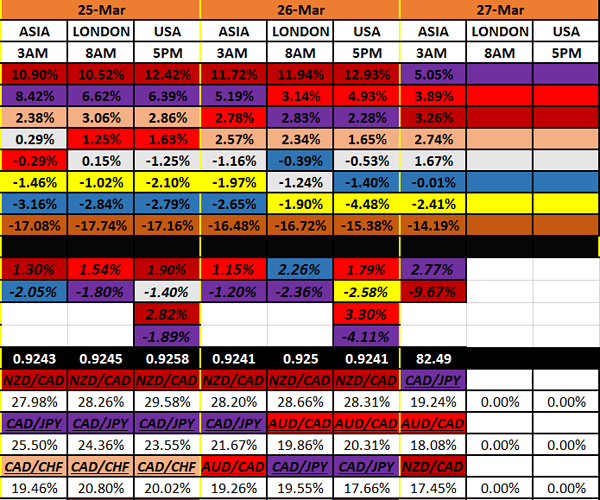 NZD (dark red) most bid that session +2.57%. USD (white) most sold that session -1.55%. Well, this is mostly some risk-on sentiment. 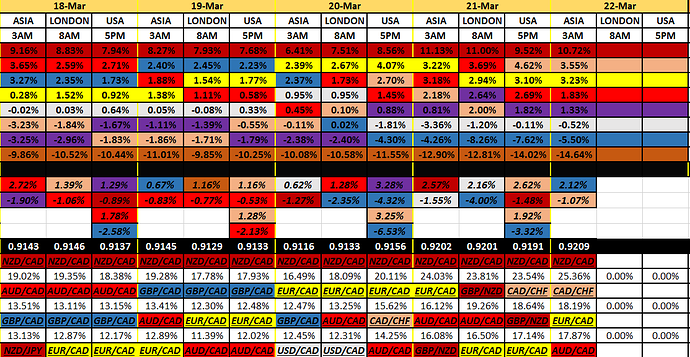 The only currency to go against the grain up there in the table is the CAD (brown). And no real big surprise there. Look like is was all about the NZD and the AUD. +2.57% & +1.73%. 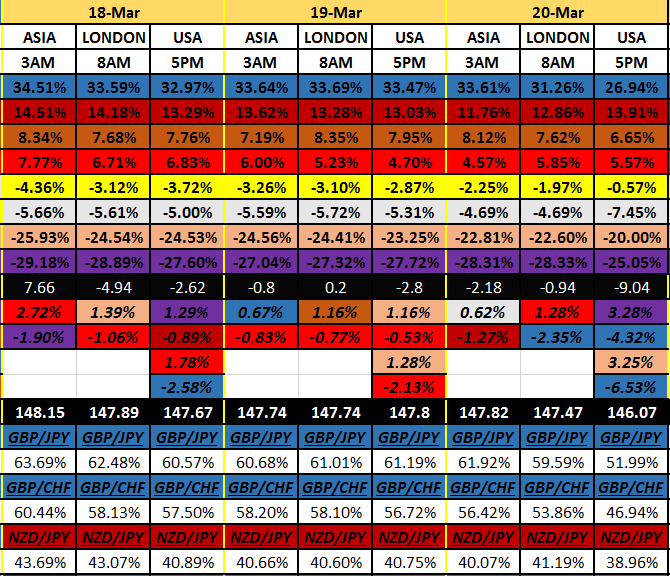 Since the last session, looks like there wasn’t any follow thru buying of the EUR (yellow) and the CHF (pink). But again, it’s not their turn yet. We’ll have to see what they themselves think, coming up now. Alright. Well, may the risk-on continue. Right? Let’s make it count today. Here’s a little more Thursday market. USD (white) most bid that session +2.16%. 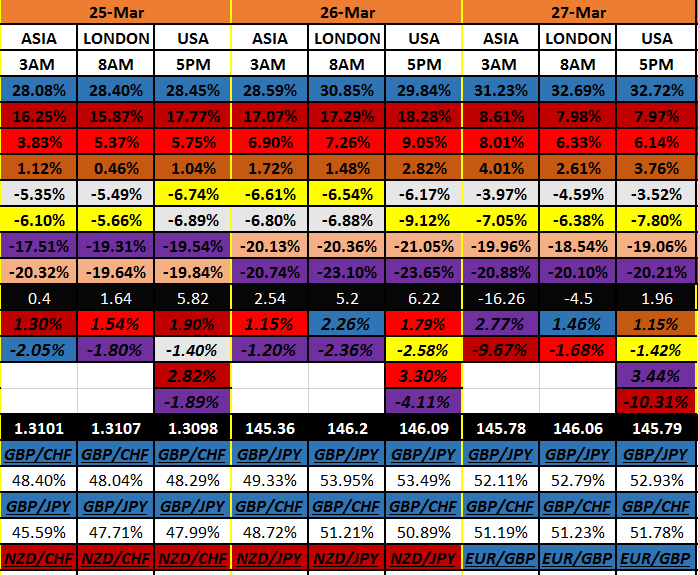 GBP (blue) most sold that session -4.00%. Wow. The USD really turned the open tide, huh? They go from the most sold during Asia to the most bought currency during London’s morning time. Interesting. The Pound (blue) is really taking a hit. Just look at yesterday’s sessions. Now 4% is quite a lot. Especially for one session. I feel bad for them. Don’t worry. I’m keeping watch on things. You can call me the watchman. So, what’s the EUR (yellow) up to? For this we have to go to the monthly table. 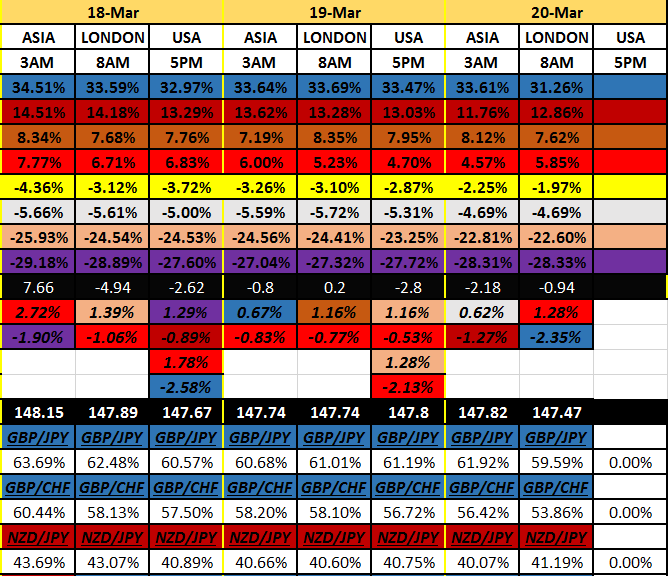 And the CHF (pink) is riding right along with them. Now that’s normal. 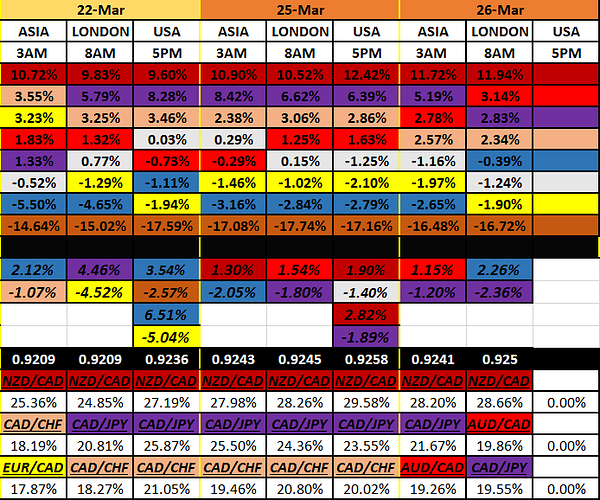 Oh, I almost forgot, I wanted to mention the relationship of the USD (white) and the JPY (purple), today. I’ve been telling you this a lot. But, it’s happening again. 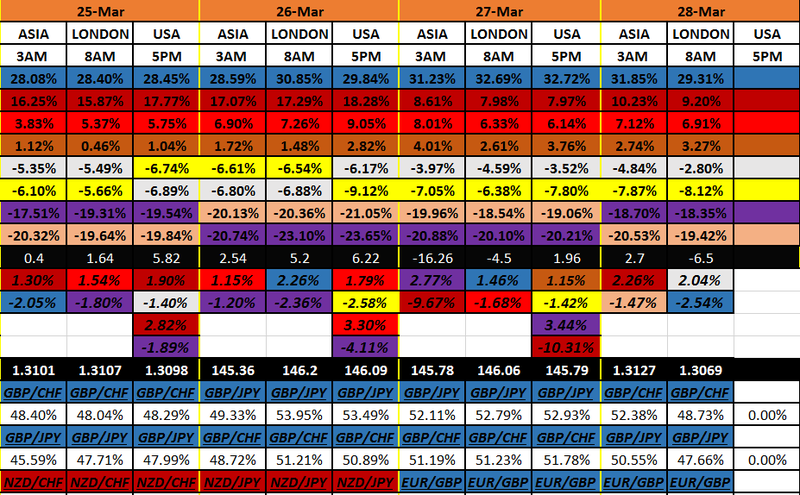 Not only did the USD grab some pips, but the JPY tailed them also. They were up +1.83% this session. That’s quite a bit. Just under what big brother took (look above). Again. We definitely have some brotherhood here. Hey…I’m here to remind us all of these currency dynamics. Also, we need to see what the end of the day will tell us also (I’m forever having to remind myself of that). Let’s make the most of this day, huh? 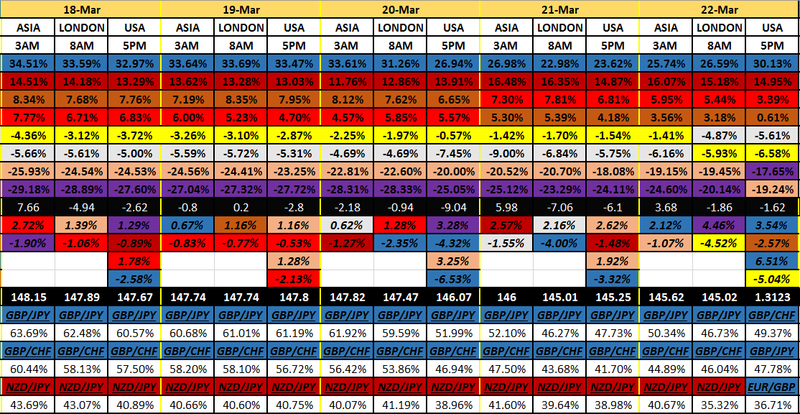 CHF (pink) most bid that session +2.62%. NZD (dark red) most sold that session -1.48%. 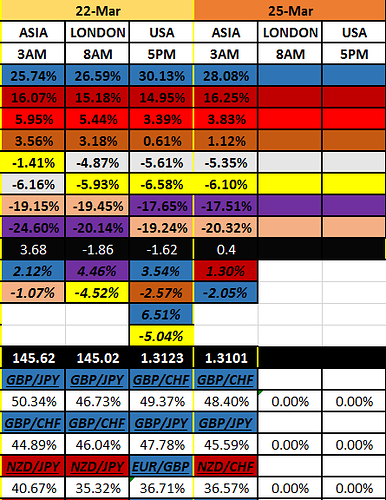 CHF most bid currency for today +1.92%. GBP (blue) most sold currency for today -3.32%. Wow. I think this is kind of weird. It was the USD, CHF, show today. 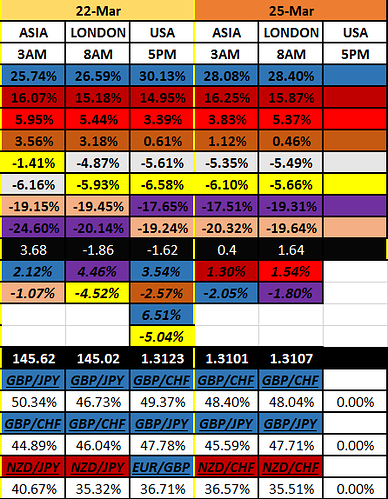 Also the JPY (purple). 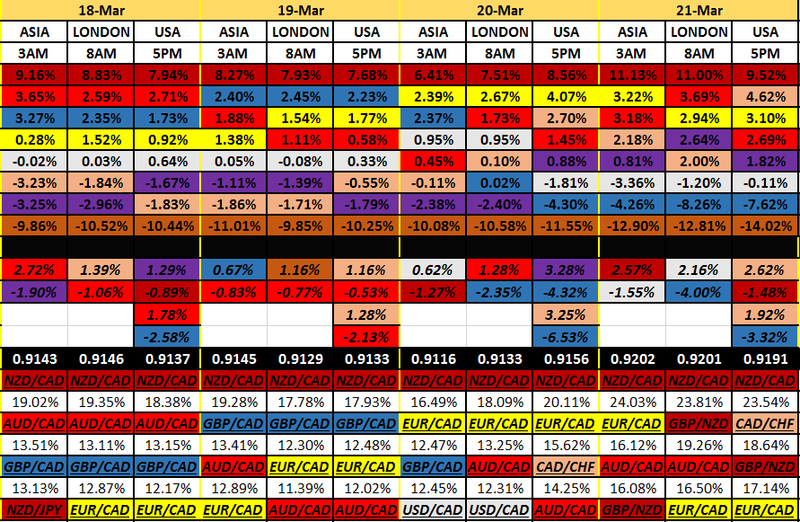 But I find it interesting to see that the AUD (red) and the NZD (dark red) were right up there with those other 3. Look. Well, I do know that the GBP (blue) and the CAD (brown) are dragging dirt lately. 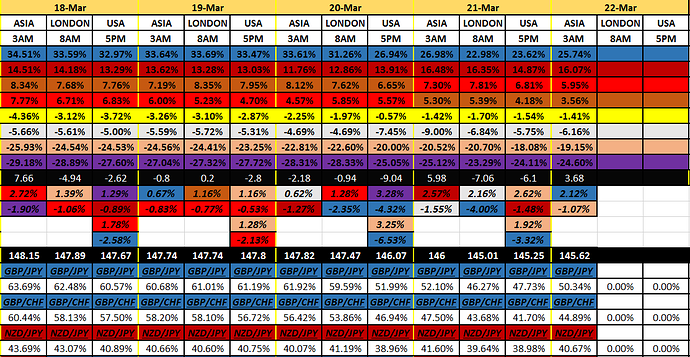 Ok. How about the monthly table. The only thing I see kind of out of place is the Swiss (pink). Man…they took Tuesday, Wednesday, and today! Yep, there’s definitely something going on. And I don’t know what. But, on the other hand. Does it really matter? All we really need to be aware of is that there’s a consensus of buying the Swiss this week. Alright. Well, be careful out there. It could be dangerous. It’s Friday. Let’s see how it’s playing out. GBP (blue) most bid that session +2.12%. CHF (pink) most sold that session -1.07%. Alright. Well, the market went back to some positive flow. It’s been since about 3 sessions ago. And the CHF finally sold some. The GBP finally got bought. That’s been awhile also. How about the monthly table. I don’t know. Kind of looks steady to me. The NZD (dark red) was up there with the Pound. That seems to be who you want to buy. Well, this month anyway. Also, the CAD seems to be the one to sell. And speaking of the CAD. Today will bring important news. Boy…I just hope the market is right. It would be awesome to see some bad numbers, huh? Look. It’s just been going that way. Like, why not go all the way. Right? Alright. Let’s get on with a Friday. The weekend is close. See ya in a few hours. JPY (purple) most bid that session +4.46%. 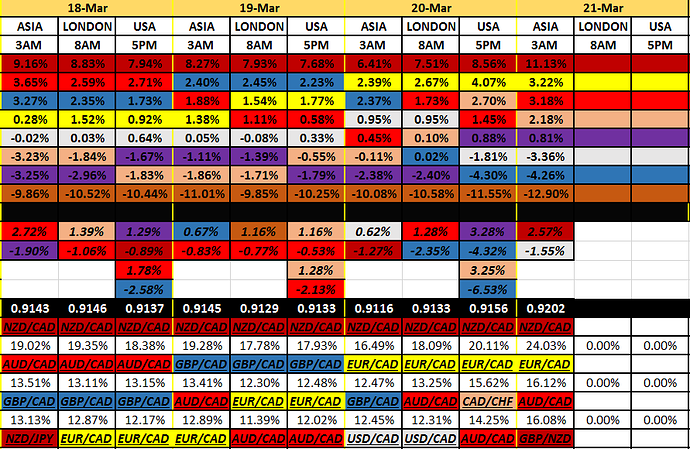 EUR (yellow) most sold that session -4.52%. Wow. We have some movement going on now. The Yen is climbing. And that’s not with any kind of relationship with the Dollar either. Something’s happening there. Well, all we really need to know is that a lot of money is moving there. The EUR is crashing, relatively speaking. And remember just a couple days ago, when the FOMC spoke. A lot of exuberant buying happening then. Well, now we know, that was nonsense. It’s not what the real movers want. See, this is what we need. We have to be patient to get the sense of where money really wants to go. Well, what has been predictable, over time, is that the CAD (brown) is still being sold off. Today will be interesting with them. Oh…that would be about right now. Well, I better hurry up with this. One more thing. The Swiss isn’t all that strong either. Unless there is some profit taking from this week. Today is Friday, and we need to realize the profit taking trading aspect. As opposed to the direction of things. That might be what’s happening with the GBP also today. They’ve taking such a hit lately. Alright. Let’s run the week out. See ya at the end. It’s over. Let’s see what happened. GBP (blue) most bid that session +3.54%. CAD (brown) most sold that session -2.57%. GBP most bought today in total +6.51%. EUR (yellow) most sold today in total -5.04%. Wow. We got a lot going on here. Changes occurring. I’ll tell you what I think. JPY (purple) is on the rise. EUR (yellow) is on the slide. Take a look at the monthly table. Yep. It’s confirmed. All you have to do is look at the purple and yellow. And what big moves today. In fact, I looked at their chart. Zoomed way out. I put in a long term trade. I’ve always wanted to do that. Well, it’s an entry limit order. If it drops to 123.820, I’ll be in. And I won’t touch that for a long time. No take profits. No stop losses. I’m calling the fundamentals about it. I think it has hundreds of pips to go. Anyway. That’s something totally separate from my swing trading strategy that I operate. I just wanted to mention that to ya. Alright. Back to the changes. Any else? Well, the CAD sure told me, today, that the money doesn’t want to go there. I mean, they didn’t have all that bad of data come out. I thought it was quite good. I’m no economist, but I’m pretty sure it beat expectations. Anyway. I was surprised to see it eventually lost even more pips. Across the board. What else. The Comms. Well, the AUD (red) took a real hit today. And their brother, just, didn’t. Something’s up with that. I kind of think that we just might be going away with the risk-on sentiment. Look. I’m thinking the Yen has something to say about that. We’ll see. All I’m doing here is thinking. That’s all. Our strategies should not be based upon that. Well, mine isn’t anyway. Alright. That’s all good and nice. It’s the weekend. And I’m excited! I got another book. Came yesterday. And cannot wait to read it. Welcome to the last week of the month, and quarter. Let’s see how it’s gonna unravel. 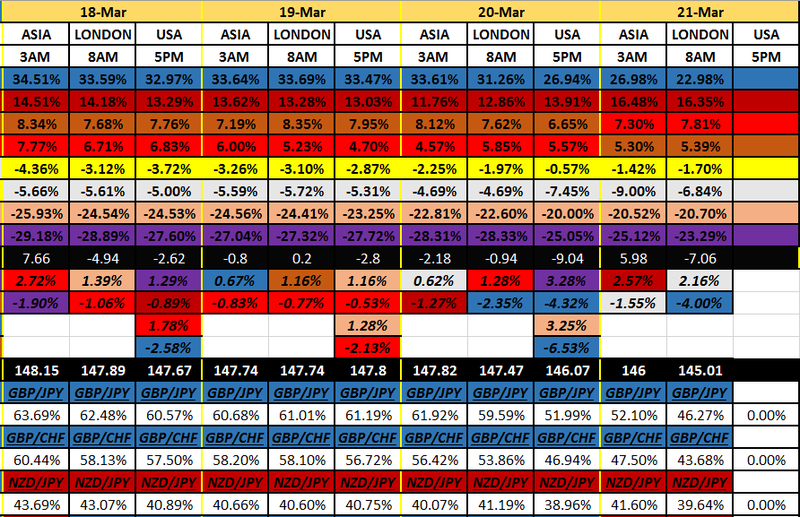 NZD (dark red) most bid that session +1.30%. 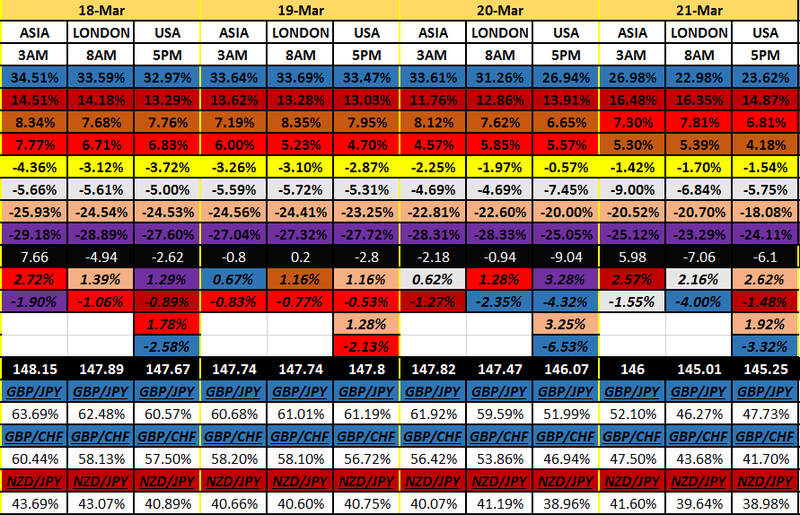 GBP (blue) most sold that session -2.05%. Well, first off, it’s Monday, and things are moving slowly. So we can’t expect much. But, I would say that there is slightly more risk-on buying than risk-off. Let’s look at the monthly table. Well, to be honest with you, the only 2 currencies that ended the session in negative numbers was the GBP (blue), and the CHF (pink). -2.05% & -1.08%. And the NZD was the only other currency to be greater than 1%. All other currencies were below 1%. So, we really need more time to get a sense of what’s happening. But don’t forget, it’s very possible to see some moves this week. We don’t know when it’ll happen, or how. We just need to be ready for anything. And it might be large. I remember last Friday. It was the EUR (yellow) and the JPY (purple). I’m gonna keep my eye on those 2, and see if any more moves come out of them. Alright. Let’s get moving on this Monday. Alright. Let’s see how Monday’s playing out. AUD (red) most bid that session +1.54%. 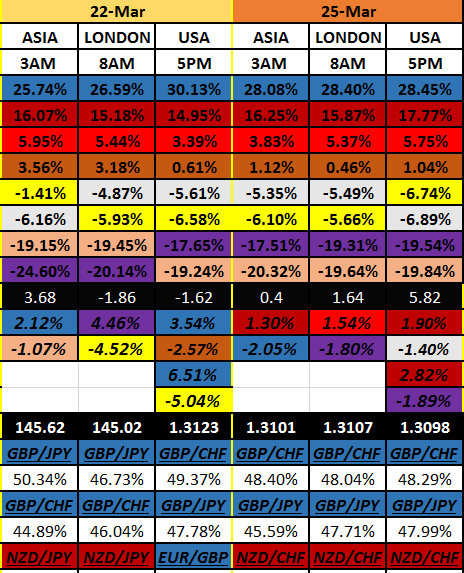 JPY (purple) most sold that session -1.80%. Ok. Well, that’s more risk-on sentiment. Nothing says risk-on/risk-off than the AUD/JPY pair. And that’s our most bought and sold currencies that session. Looks like the NZD (dark red) relinquished the control over to big brother, for the second session. Little more confirmation of that sentiment, huh? What’s the monthly table looking like? Honestly, there’s not much I can say. It’s Monday and no real moves happen on this day. All we can do is just compare how the Europeans think as opposed to the Asians. Well, that’s one way of looking at it. The JPY (purple) buying slowed up a good bit. We’ll have to see what the Americans think about that. Will they want more Yen? Or less? Alright. I’m done talking. Time to get some real work done. Make it a good day today! Monday’s in the books. Let’s see what happened. 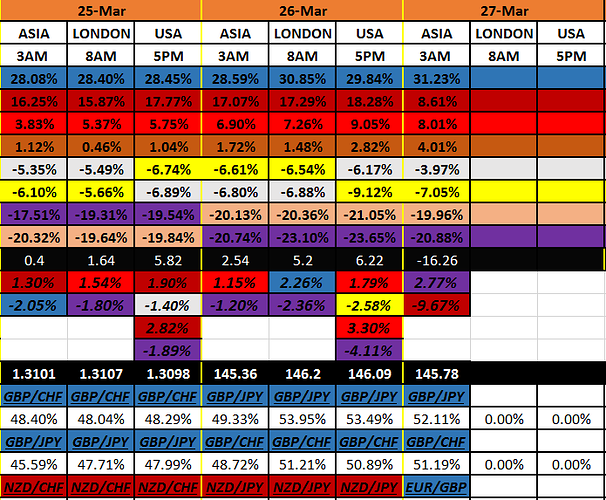 NZD (dark red) most bid that session +1.90%. USD (white) most sold that session -1.40%. 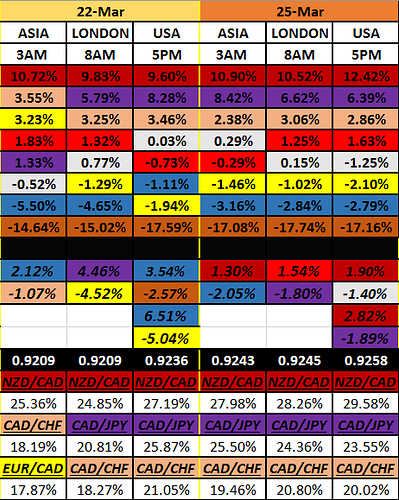 NZD took the day being +2.82% today. JPY (purple) lost the day being -1.89% today. 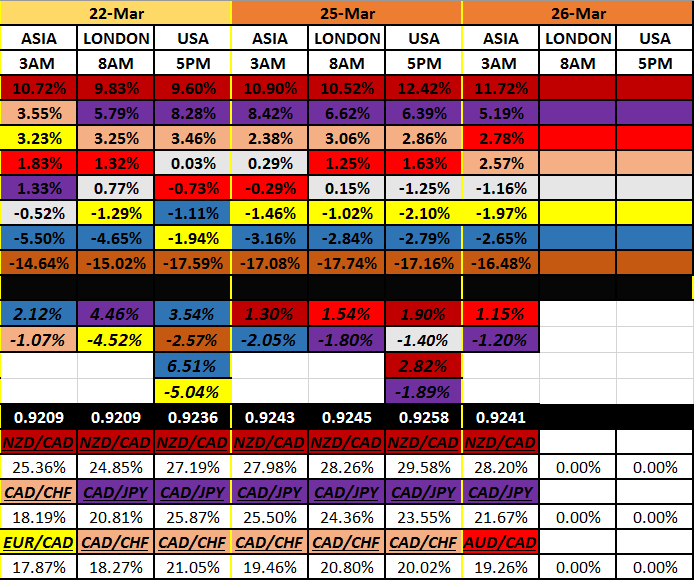 Looks like both the USD (-1.28%) and the JPY were a favorite for a sell today. Well, the Pound joined them also today (-1.68%). Other than that, I would say that the Comm brothers had the most attention, for a buy. Look. I know this is the easiest job in the world to do. And that would be hindsight announcements. Believe me, I’m aware of it. And I hate it. But, just remember, I’m the watchman. I believe the more you pay attention and are aware of how things are progressing, you have that much more of an edge. Anyway. How about the monthly table. Now…I don’t think there’s an excuse to not know that the NZD/CAD trade has been a good trade (believe me, I’ve reaped much from that). But, all you have to do is see how much percentages they are on the ends there. I do have to say though. I’m backing off now, from that. We’re heading into the end of the month, quarter. Things very well might get shaken up. No doubt I can be wrong about that. But, it would be stupid not to be aware of it, at least. Know what I mean? Don’t worry. I’m keeping my eye on the Yen. Big brother is watching. I’ll let you know if they really want to go somewhere. Plus…you’ll see it with your own eyes. Let’s make it a good night. See ya in the a.m.
What’s happening on this Tuesday. 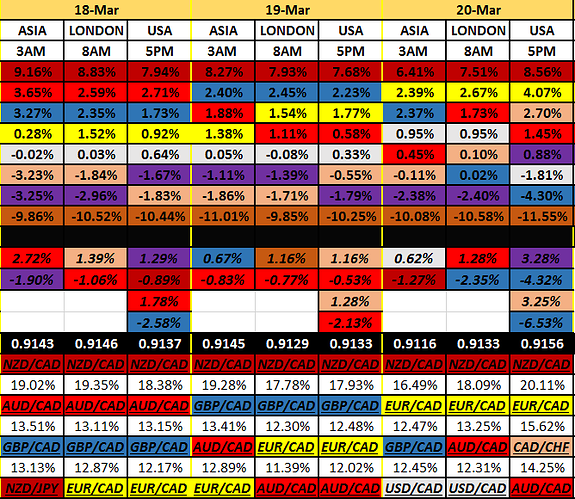 AUD (red) most bid that session +1.15%. JPY (purple) most sold that session -1.20%. Yeah, I thought this looked familiar. It wasn’t the last Asian session, but it was during London’s open yesterday. The 'ol risk-on scenario. It is kind of weird to see the NZD (dark red) not get any of that. They ended that session being -.70%. shrug Interesting, I think. We’ll see. Look. 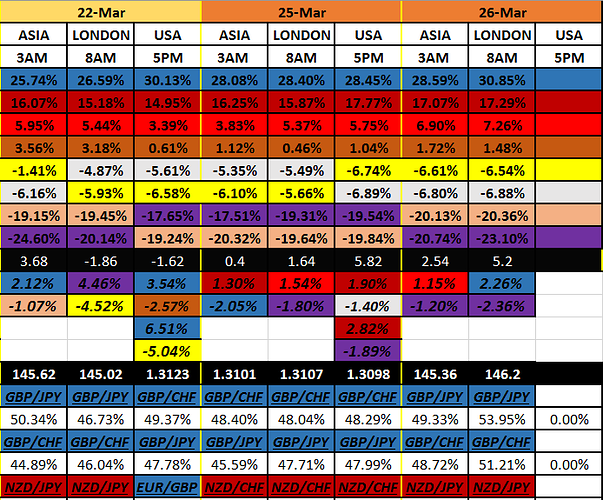 There’s not all that much movement happening with those currencies in the middle. Their all within a couple percent of each other. The outer ones would have to move a good bit to get knocked off. Cause seems like their untouchable, unless a major move would happen. It’s still on the early side. But, if there would be a real change, I would think it to come like Wednesday. We’ll just have to see. Thinks like to fly on Wednesday’s. Make it a good day today. GBP (blue) most bid that session +2.26%. 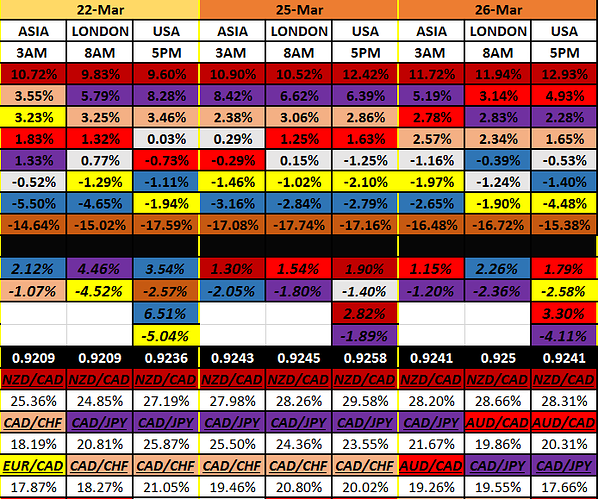 JPY (purple) most sold that session -2.36%. Alright. Here we go. Let me show you how the day is unraveling. I took this pic only about 2 minutes before 8am. That’s the JPY. Yes. They are what’s being most sold today in total. It’s a pile on today, so far. So, by looking at it this way, we can see that the GBP is what’s mostly being bought. I also find it interesting that the AUD and the CAD are quite a bit bid. But not the NZD (In the comms context). In fact, the NZD is the second to the most being sold. Next comes the CHF. Well, if you look up at my table up there, the running %'s since the beginning of the year, it all lines up. 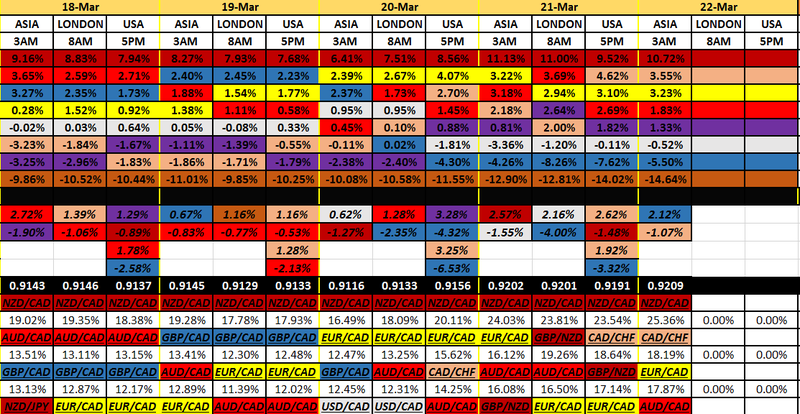 All except the NZD. I find that interesting. I don’t know. You can probably cut and splice it many different ways. And I don’t want to do that anymore. All I know is that I’m wanting to find some meaningful changes. And at the present time, I’m not finding any. First off, the end of the day hasn’t come yet. 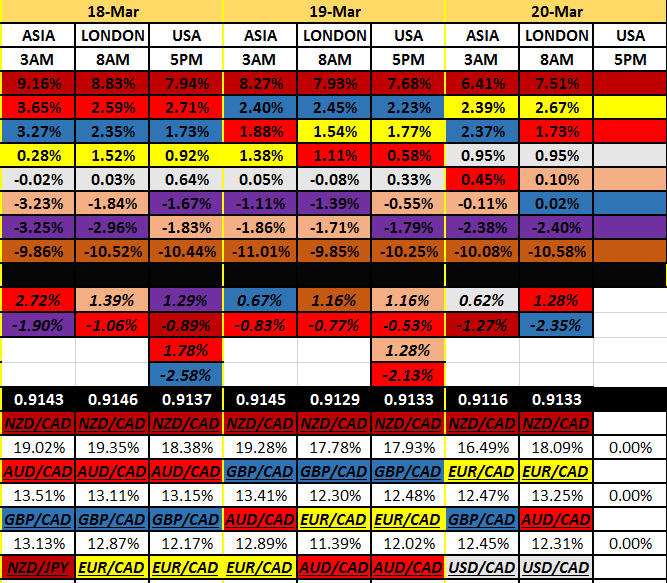 Secondly, until the ends (NZD, CAD) get replaced, I wouldn’t say much is happening. You never know, there might be a reason the JPY climbed up to second (EOD yesterday), and maybe by the end of the week, it could happen. All I’m saying…is don’t count them out. Just yet. As always. We need more time. First, EOD. Then day by day. Then, the end of the week. But honestly…I don’t really care. I’m just throwing out real possibles. Remember, never hope. Play the probabilities. Let’s get some real work done today. AUD (red) most bid that session +1.79%. EUR (yellow) most sold that session -2.58%. AUD most bid currency in total today +3.30%. JPY (purple) most sold currency today -4.11%. Well, that was a lot of selling of the Yen today. Interesting. The EUR took a big hit during the US session. The CAD (brown) caught a bid today. Man…the AUD got a big boost today. Like all day. Interesting. Wow. 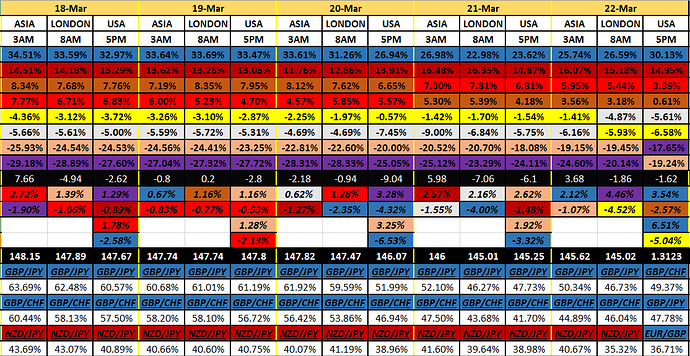 You can see more clearer there how much the JPY (purple) has been taking a hit. Just look at Friday’s % of them. They sky rocketed from running a monthly total % of 1.33 to 8.28. Well, apparently this is a big retracement of that. Looks to have not held. So far. But I do (still) think the EUR (yellow) is interesting. I don’t know what happened today, but they fell apart. Ok. We really need to see how this week turns out. Tomorrow very well can be some volatility. Hang on. 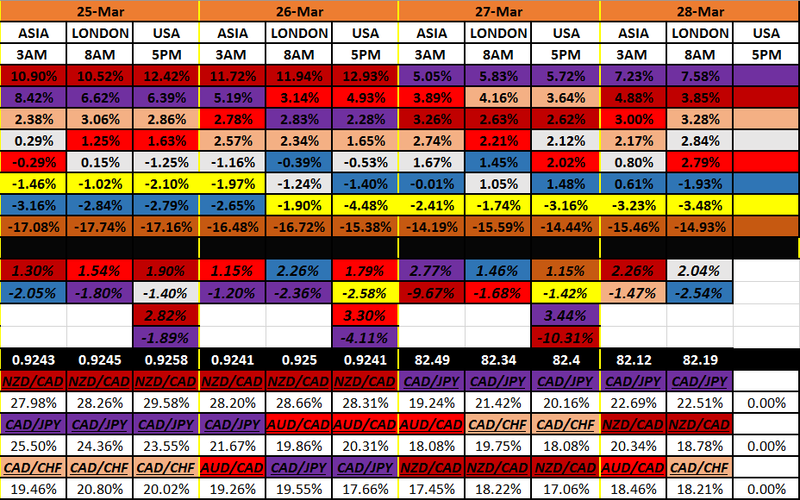 JPY (purple) most bid that session +2.77%. 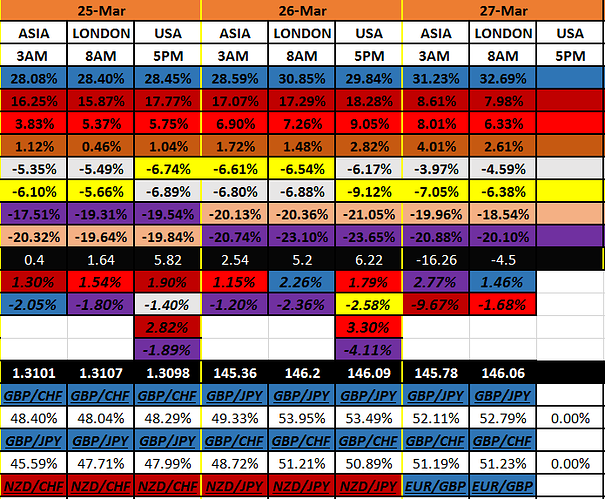 NZD (dark red) most sold that session -9.67%. Don’t have time to talk. But, it’s happening. All I know is that there is some serious profit taking on that NZD. I don’t know if I’ve seen an over -9% session yet. Holy Moly. I’m telling you…have been…this is gonna be a volatile day. Please be careful. I’ll talk later. 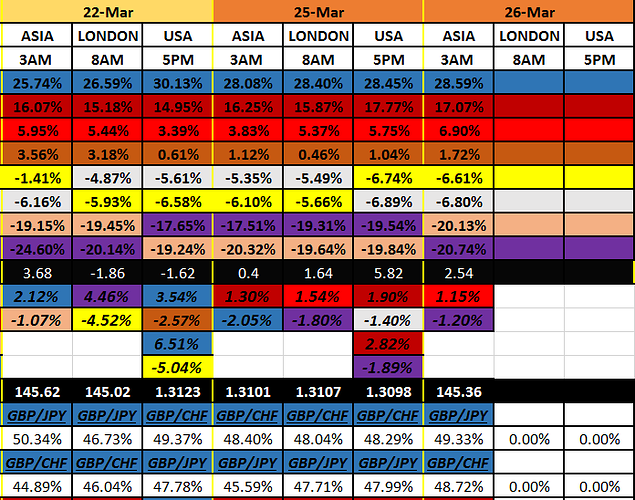 GBP (blue) most bid that session +1.46%. AUD (red) most sold that session -1.68%. Well folks, it’s continuing. Just look at the numbers there. Let’s look at this. For the day running. It’s all about the Majors today. We’re separating the men from the boys. We all know the USD and the JPY run together. No surprise there. Also the EUR and the CHF best buds. The Comms are taking a massive hit. Mostly the NZD. But, I just wonder if that’ll be the extent of it today. Boy…I can’t imagine any more. But, we’ll have to see what the Americans do. But, I can imagine that the JPY could be a favorite. I wouldn’t put anything past them. In my mind, the sky’s the limit for them. You have to see what’s really happening here. All in all. It’s a massive selling of the NZD. Sure, all of the currencies are moving higher than normal. But aggregately speaking, MOST of the attention is the NZD. A sell. We still have end of day to see…also end of the week. We’ll have to try to find what’s going to be the favorite. Cause don’t forget, profit taking is different than what’s trending. Ok. Let’s look at it. Wednesday’s results. 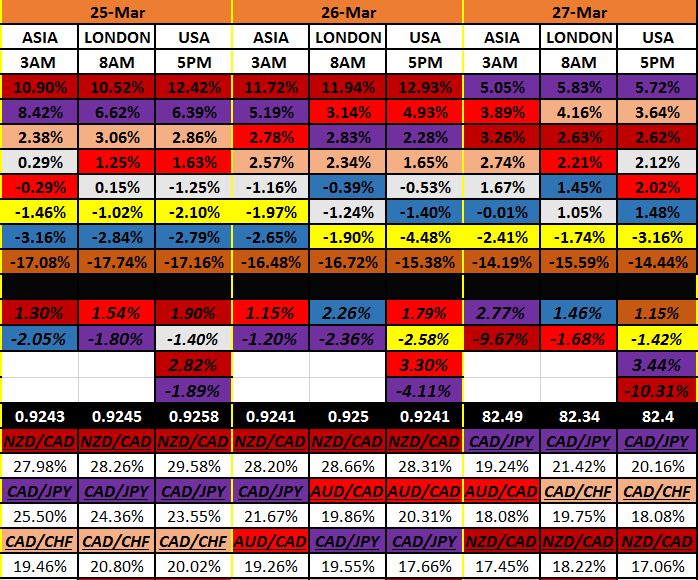 CAD (brown) most bid that session +1.15%. 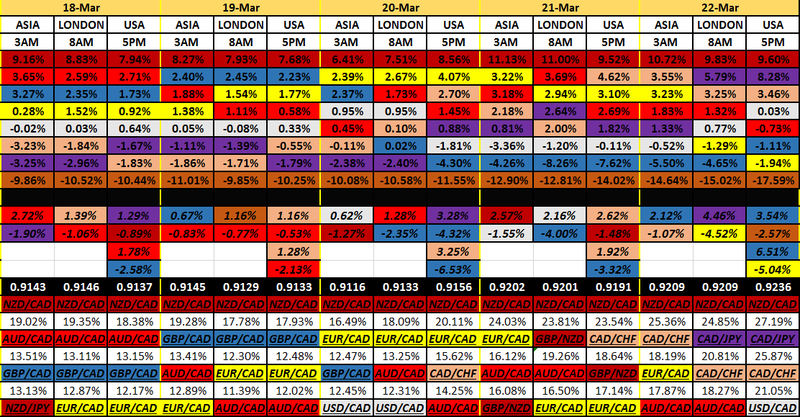 EUR (yellow) most sold that session -1.42%. JPY (purple) most bid currency today +3.44%. NZD (dark red) most sold currency today -10.31%. Alright. Well, I know what happened today, actually just after yesterday’s close, with the NZD. They had an interest rate decision. Of course it stayed the same, but they are definitely saying the next course of action would be a cut. Bottom line is that’s it’s not looking good at all for them. Many risks. Basically, bad news. That’s looking forward. So…that’s the reason behind them dropping out of the sky. Not profit taking, like I thought. Of course, it could have been the perfect timing for it. Well, let’s look at the monthly table. 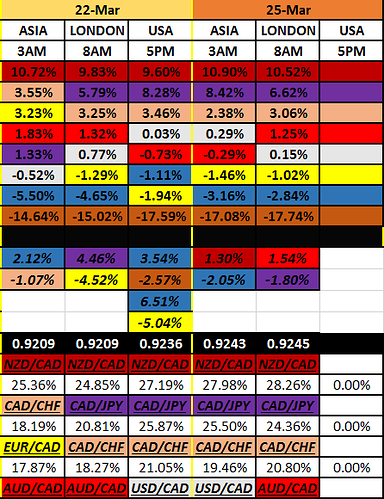 What we have here is the JPY (purple) taking over. The Comm brothers are out. They basically fell from grace. This is in the context of this month. Now, according to the above table (yearly), they are still in the positive. But approaching the 0% line. Will be interesting to see how the rest of this week plays out. No doubt things are changing. And what do you know…it’s around the turn of a month. 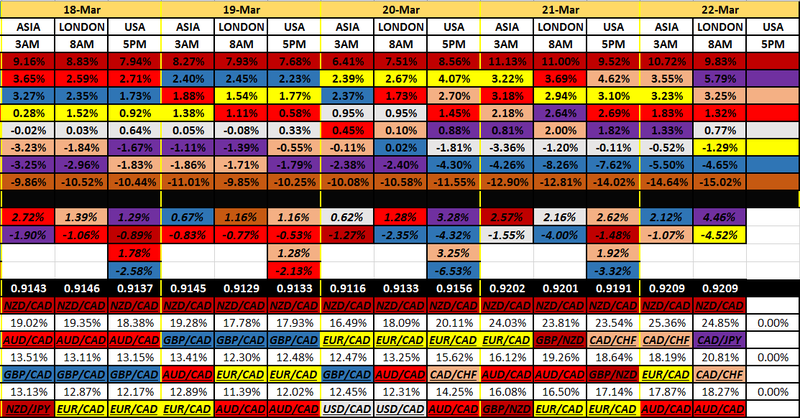 The only other thing catching my eye, is the EUR (yellow). That’s 2 U.S. sessions in a row that they were the most sold currency. I have a feeling they just might be on the out. Who knows. We just might be heading into a safe haven (risk-off) sentiment. We will see more in the next 2 days. NZD (dark red) most bid that session +2.26%. CHF (pink) most sold that session -1.47%. Kind of interesting. The second most bid currency that session was the JPY (purple) coming in at +1.51%. But, both the Comm brothers were positive. I guess it’s a mixed bag. I’m sure there’s a lot of different agenda’s going on. We’re closing in on the end of the week. The CAD (brown) couldn’t hold on to the pips they made yesterday. Back at it. Down. USD (white) most bid that session +2.04%. 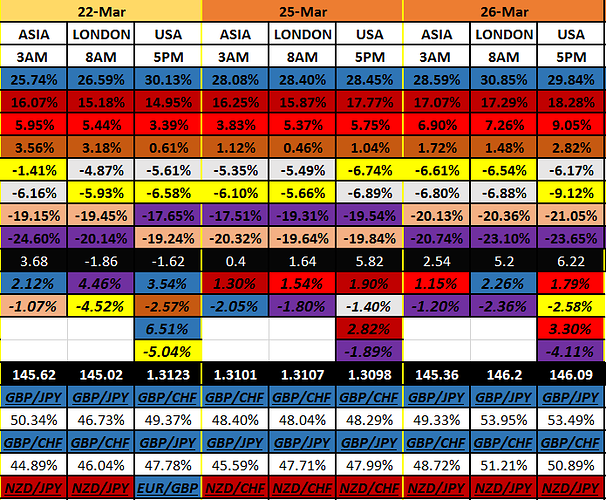 GBP (blue) most sold that session -2.54%. Well, not a whole lot happened then. Nothing catching my attention anyway. The Comm brothers lost some of the gained pips from last session. The EUR (yellow) is sliding. The JPY (purple) is still climbing. And the Dollar did a pretty good rebound since the open. Cause they ate some dirt on that first session. And to put a wrap to it…both the CAD (brown) and the CHF (pink) are just steady. Well, aggregately speaking, we have the JPY taking out the Comm brothers. So, still looks like this might be the change. What do you say we take a step back and look at this month. This is the Daily’s for this month. Ok. So. Walk with me here. Take note of the JPY (purple) leading up to NFP Friday. That was a pretty good climb. Then…down it goes…ever since. Kind of like it wants to take the reins, but no take. Now we’re heading into the end of the month, already on top, and now what? Well, I don’t know, and really, no one does. Ok. So. 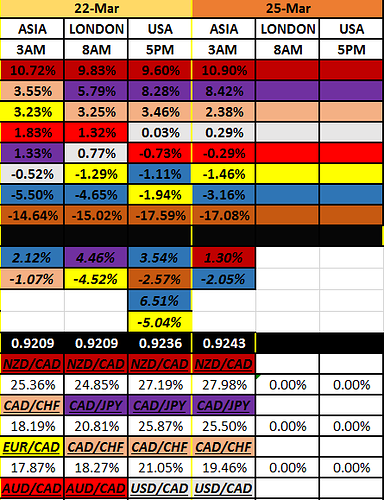 How about the NZD (dark red). Again. Before NFP, was riding pretty high. But, NFP hits, and it’s all in. Right? Then, yesterday, the bomb went off. Party over. Who’s gonna take over? Well, so far, it looks like the purple one. Got to say though, the CAD (brown) was a good consistent sell though out the entire month. Look. The only reason why I’m making these points is because there are consistent flows taking place. And mind you, we only can see this after the fact, and over time. Honestly…it’s the only thing we got. We are in the same boat as everyone else. So, if anyone else is seeing something interesting, don’t be afraid to chime in. In this case, it’s all about how they are relating to one another. Right? Alright. Let’s get on with the day. Be careful. See ya at the end.